August has finally arrived and as our temperatures climb I find it quite difficult to stay indoors. It is this exact reason that most Albertans look forward to the August long weekend. It marks an extra day of fun in the sun! It is a time to enjoy a get together with friends, outdoor BBQs and a little getaway from the city if you are fortunate enough! The Colombia Valley holds a sentimental spot in my heart. When I was a child, every summer my grandparents would pack up their trailer and take me out to the BC Rockies for a week of camping and adventures! I am happy that this tradition has been carried on and now we try to take my children out to Columbia Valley during the summer to enjoy their grandparent's cabin. I was lucky enough to have the long weekend off work and so we packed up our vehicle and drove out to our oasis away from home. There is nothing quite like a weekend away where your biggest decision is weather you are going to take a dip in the pool, enjoy some mini golfing, take a ride on the boat or laze in the sun! It was a great chance to go and visit with family and catch up on some rest and relaxation. Another delight of the weekend was how much the food choices and restaurant choices have grown in Invermere and Fairmont Hot Springs in the last couple years. A few years back the local grocery store stocked a few gluten free choices and the default choice at a restaurant was a simple salad. Now the entire valley boasts an abundance of gluten free choices both from grocery stores and restaurants. In Invermere during the summer there is a market every Saturday morning from 9am-1pm. The market features crafts, produce, baking and food products for purchase and the odd street entertainer to delight the kids. The market gives you a great glimpse into what some of the local businesses can offer as gluten free options and they have menus and small samples of products to purchase at their stands. It is a must on our list of thing to do every time we visit. The moment you walk into Fairmont Pizza and Ice Cream Parlour, you cannot help but salivate at the aroma of their appetizing pizza. Featuring homemade gluten free thin crust pizza available with a variety of toppings. The pizza is delicious, I enjoyed a spinach, artichoke and chicken pizza which was cooked to perfection. They prepare the gluten free pizzas in a separate oven to prevent cross contamination. They also carry gluten free ice cream cones and are very knowledgeable about which ice creams are gluten free and which are not. My personal favorite was the cafe latte and the coconut ice cream. Heaven in a cone! The staff here is super friendly and very helpful! We definitely plan to make this a regular stop on our outings to BC. This wonderful kitchen is the jack of all trades and is located in Fairmont Hot Springs. They offer fresh and seasonal items and the option to dine-in, take-out and a shop to buy your favorite products and bulk foods. They are open for breakfast, lunch and dinner and serve items such as wood fired oven baked eggs, gluten free pizza, salads, ribs, curries, a variety of daily features and more. We were lucky enough to visit From Scratch at the Invermere Market and we sampled their homemade bacon jam which was unique and very tasty. It would be great on baked potatoes, toast or anything you can imagine. They also make a host of other products available for purchase at the market and at their restaurant. The other noteable item at the market was their gluten free baked goods. There was a gluten free baked apricot scone and a chocolate zucchini muffin. I opted for the velvety chocolate zucchini muffin and it was divine and a hit with both myself and my children. 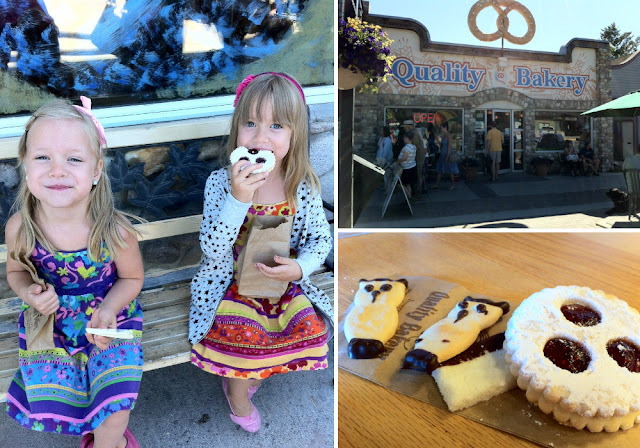 This bakery was established is 1956 and is in the heart of Invermere. They prepare freshly baked breads, pies, pastries and lots of yummy baked goods. They also serve coffee and a few items for dining in. In their shop they stock a few pantry gluten free items for purchase and also carry gluten free bread which is available frozen. The bakery also has a small section that is dedicated to their freshly baked gluten free items. Since this is my children's favorite place to visit, we stopped in to see what they had available. My children were delighted to buy a jam filled shortbread cookie, character chocolate dipped cookies and a coconut dipped in chocolate cookie. This has been a favorite restaurant of ours for years. Located on Lake Windermere, it is always a joy to be able to enjoy a meal outdoors while enjoying the views of the lake. Their menu features many items which are noted on the menu as being available gluten free and they feature gluten free bread. My personal favorite is the chicken guacamole burger minus the bun. Located at the entrance to Invermere, this restaurant is attached to the Super 8. On previous visits to the Valley, we have stopped by this large restaurant and feasted on their gluten free options such as thin crust pizza, burgers, salads and sandwiches. They have numerous gluten free options and the food is always delicious. This is your go to grocery store for gluten free staples. Located in Invermere (712a 10th St), Grant's carries gluten free pasta, breads, cereals, flours and everything you can imagine for preparing a gluten free meal on your own. There are tons of other wonderful places to visit in the Columbia Valley, this is just a few that I adore. If you have a favorite gluten free spot to visit in the Colmbia Valley, feel free to leave a comment below to share with others.